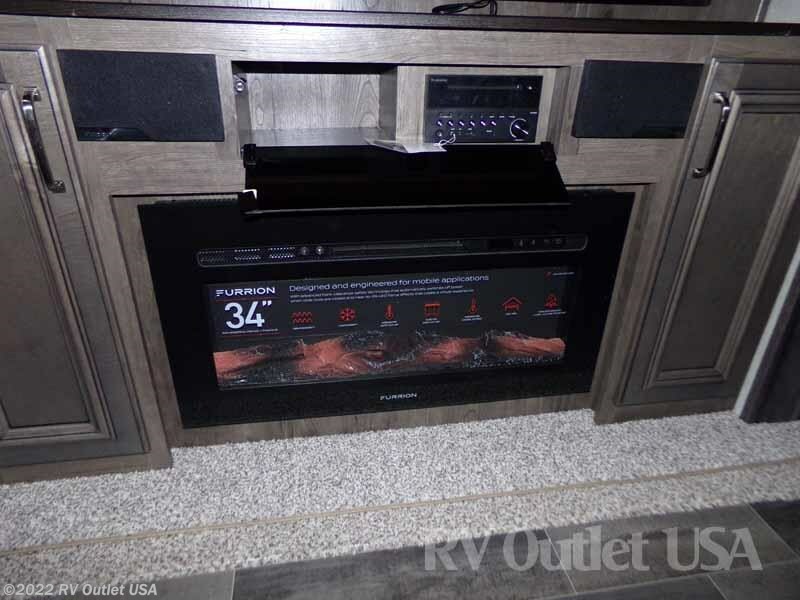 2" RECEIVER HITCH ** ELECTRIC FIREPLACE ** DUAL A/C'S! 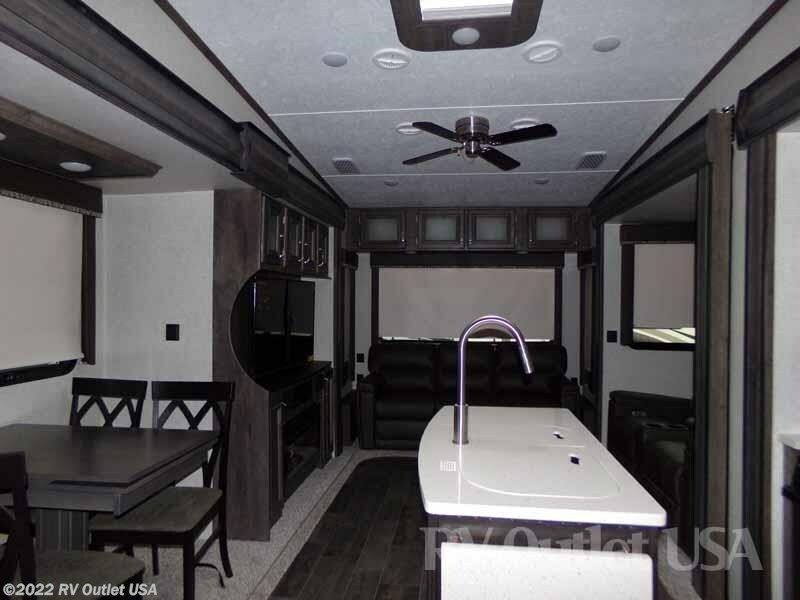 Introducing one of Keystones newest rear lounge 5th wheel floor plans in their High Country line up. 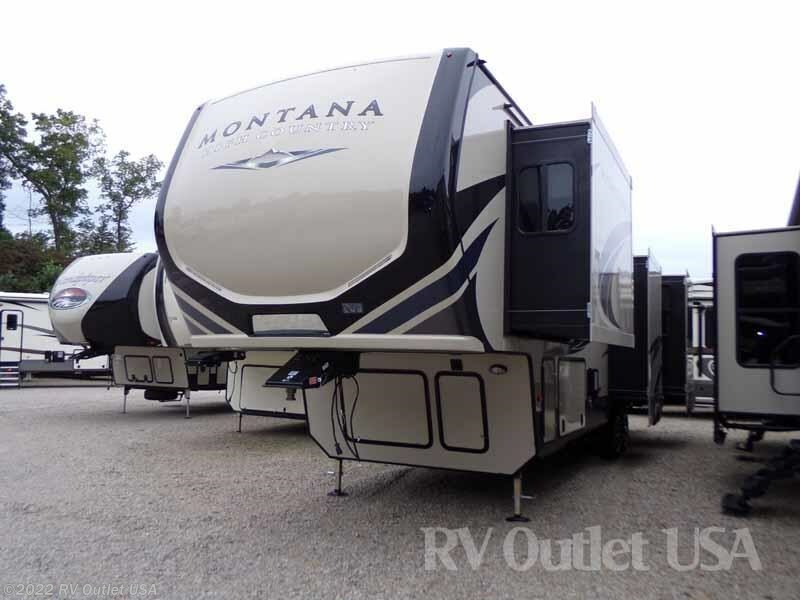 The all new 2018 Montana High Country 345RL! 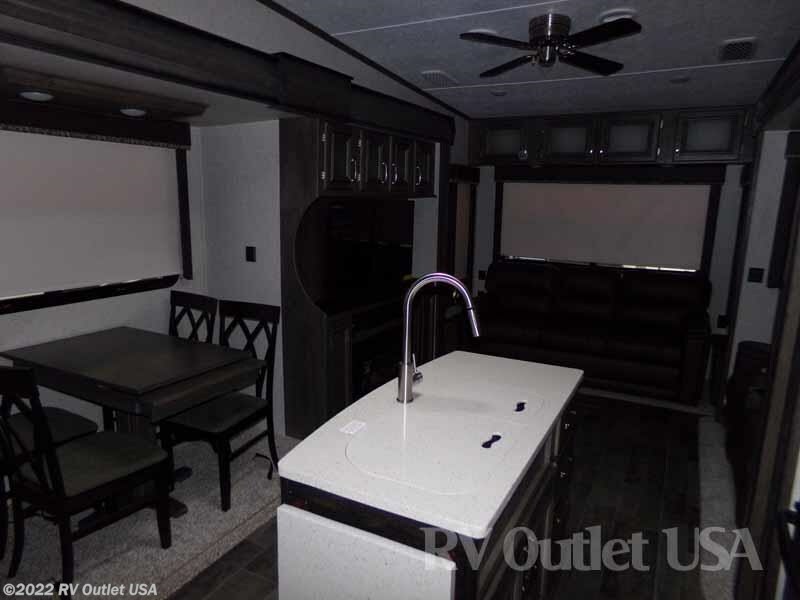 This 5th wheel has (4) slides, it's only 36' long, it has the new Mega bathroom, an exterior kitchen and it weighs only 11,555lbs, and I just named a few of the features this coach has. 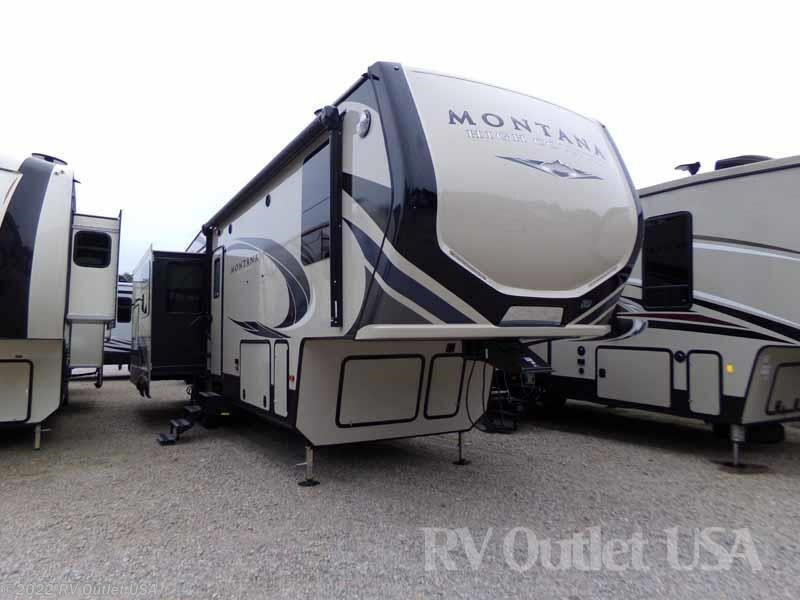 The new High Country's are new 100" wide bodies and have the new style painted front caps. 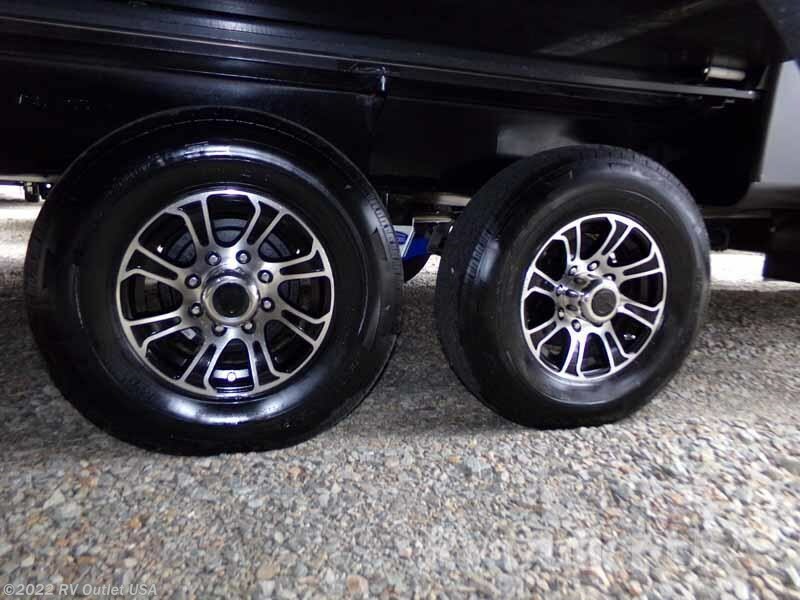 They look super nice! 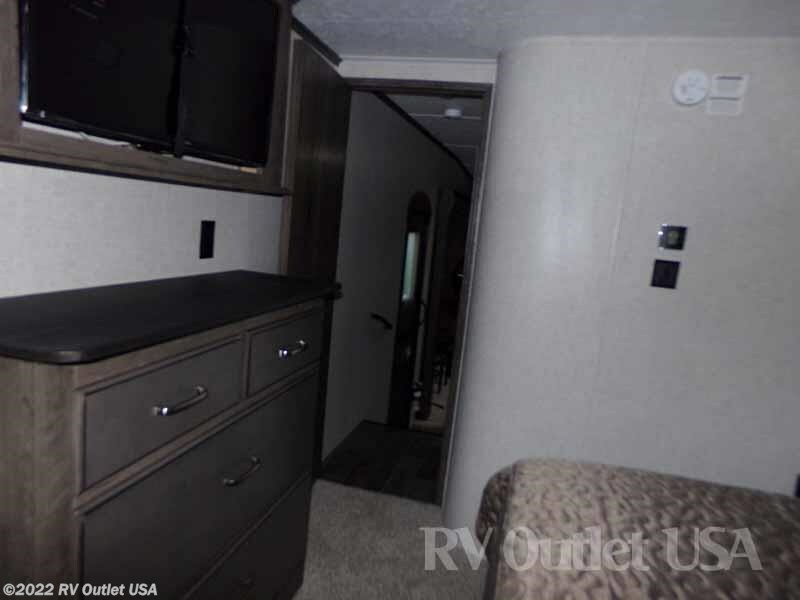 The 345RL floor plan again, has (4) slides. 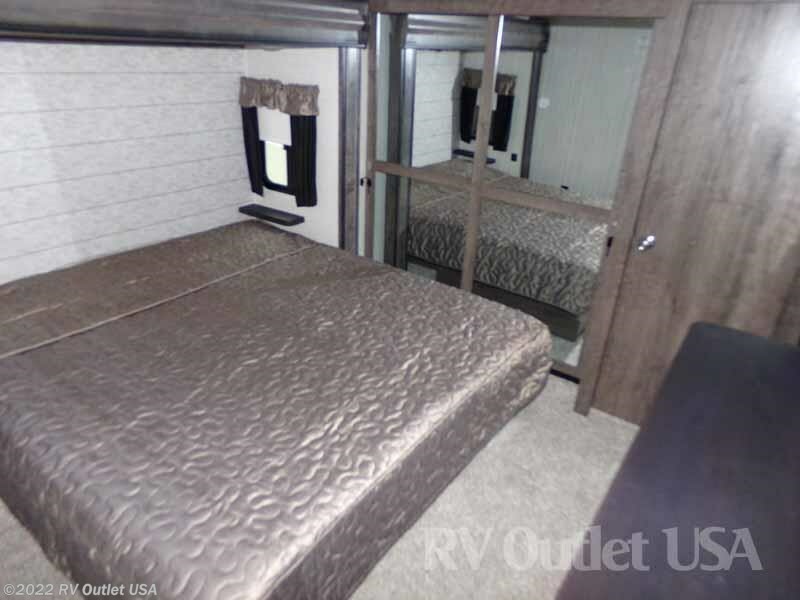 It has a King bed slide in the master bedroom with a huge double door front wardrobe which is washer/dryer prepped, it has a large dresser at the foot of the bed, and cabinets above the dresser with a built in 32" LCD TV. 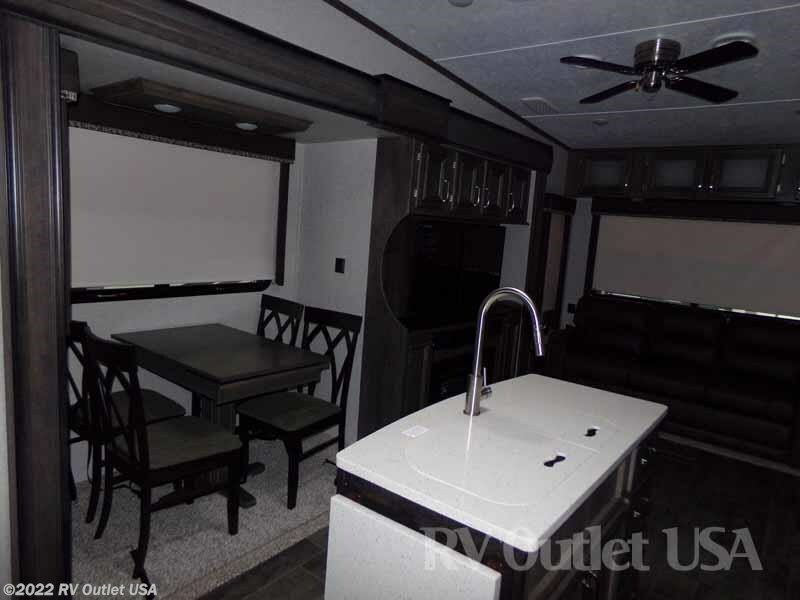 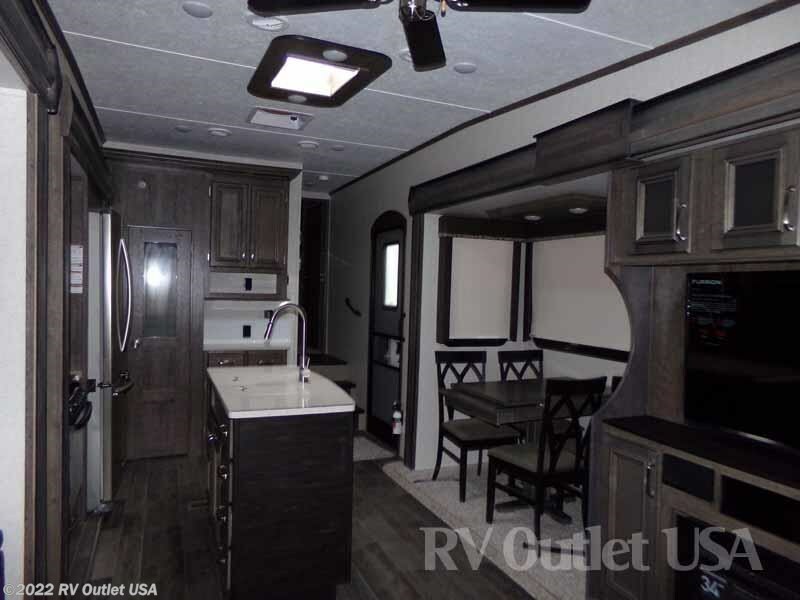 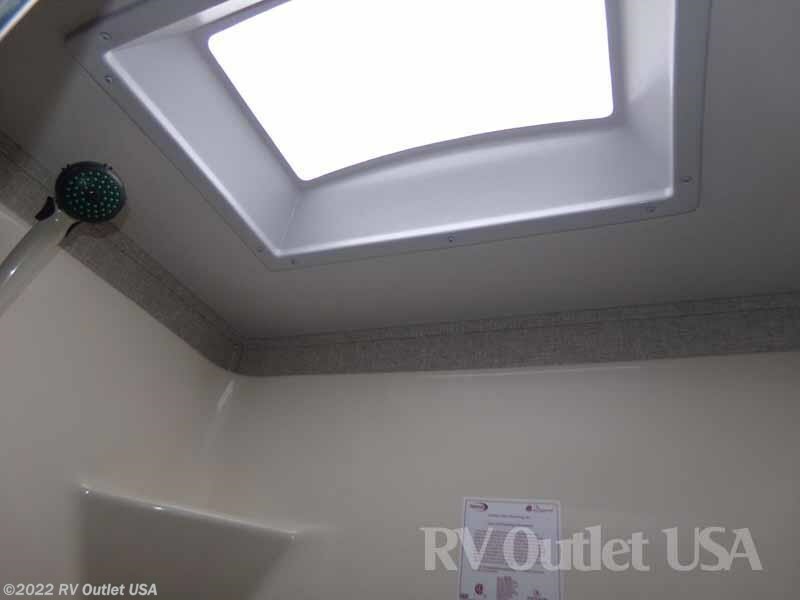 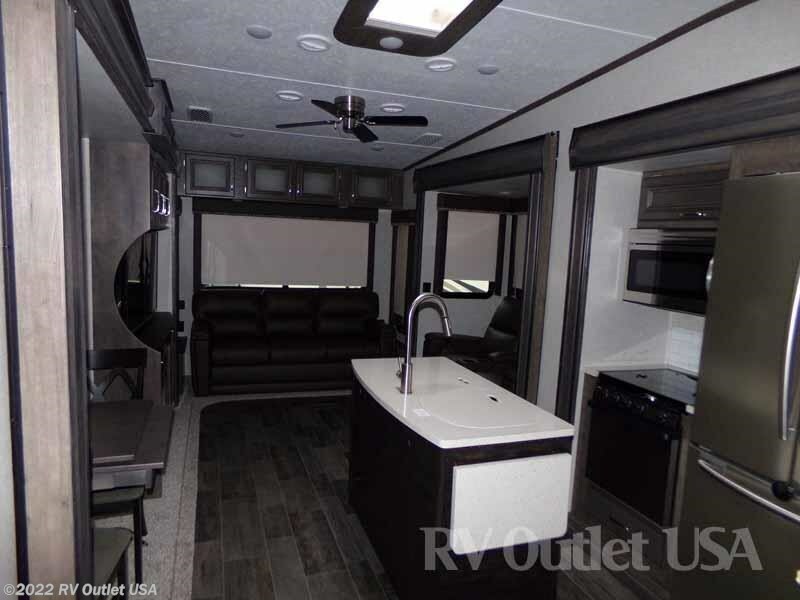 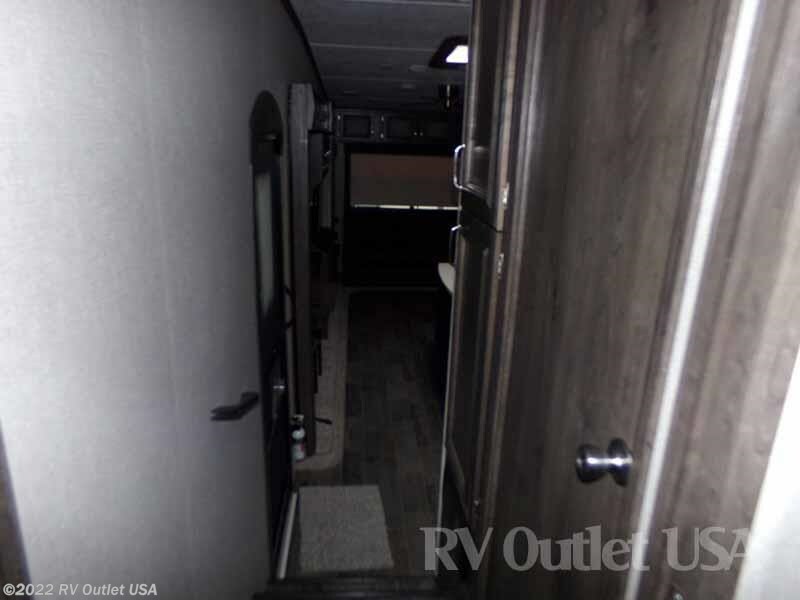 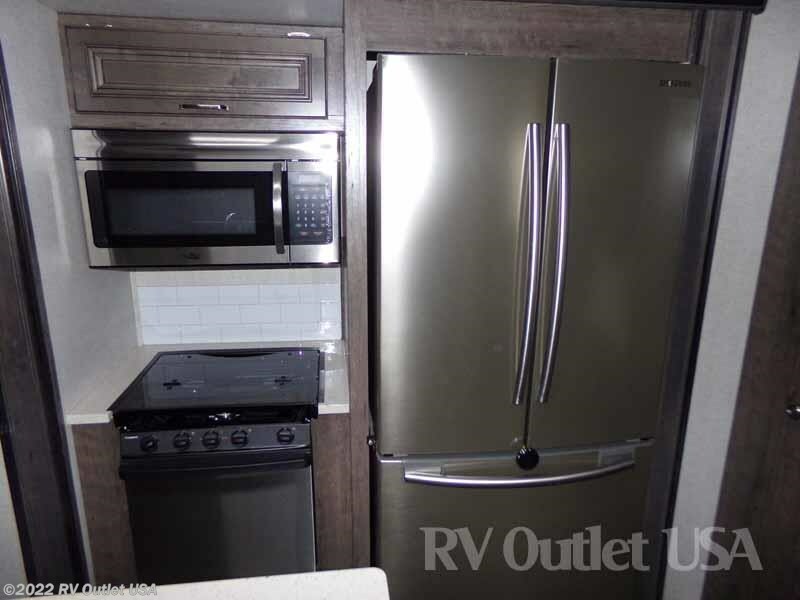 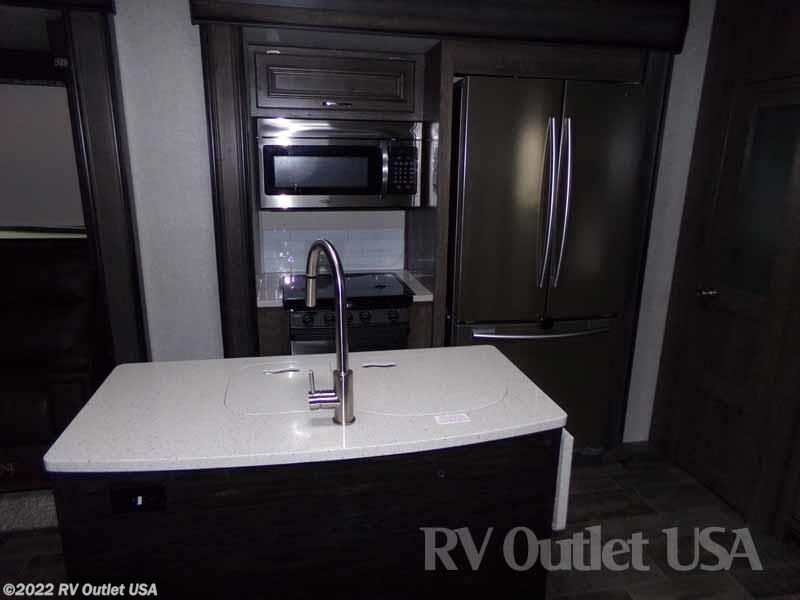 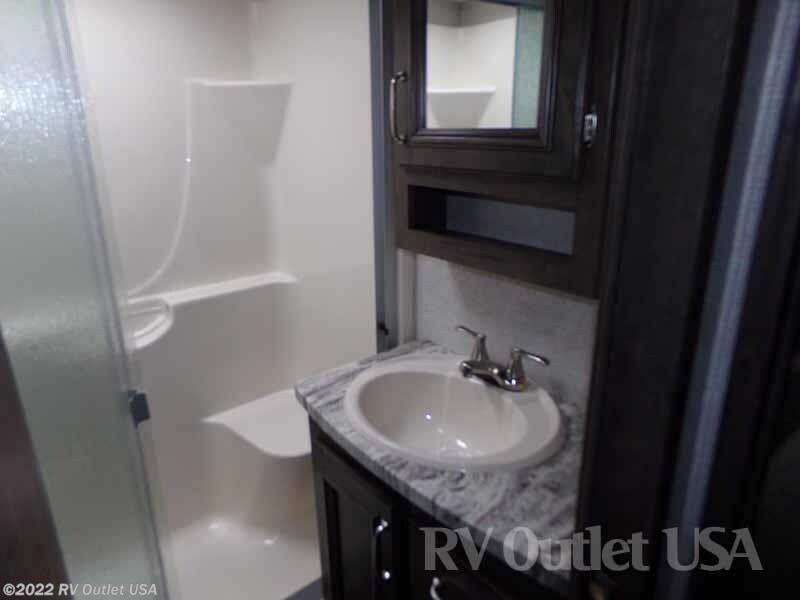 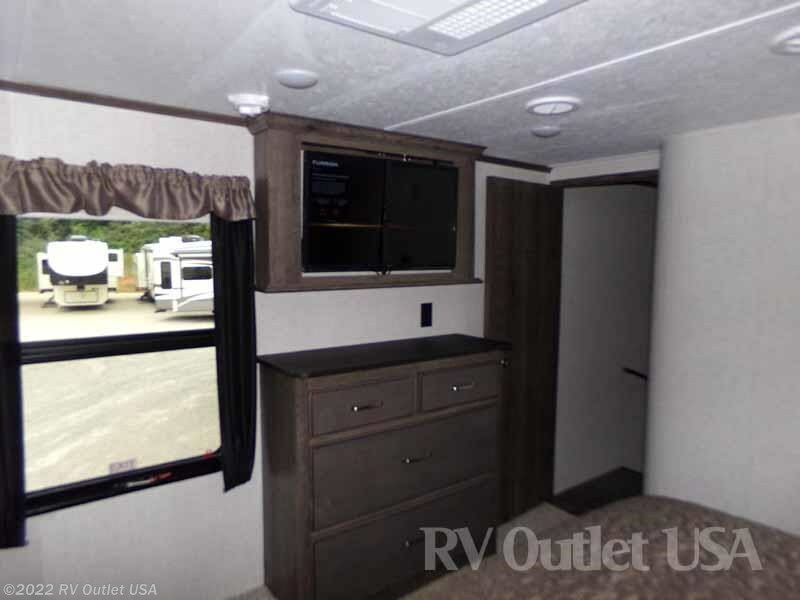 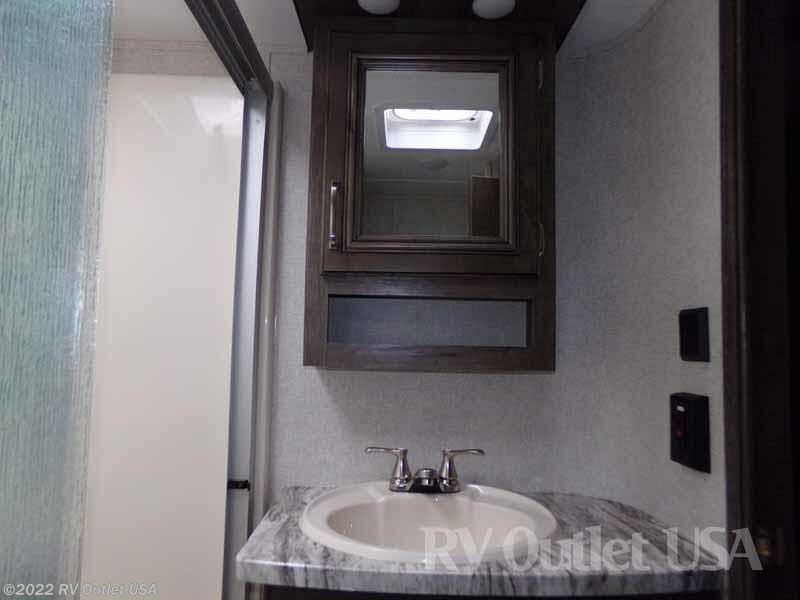 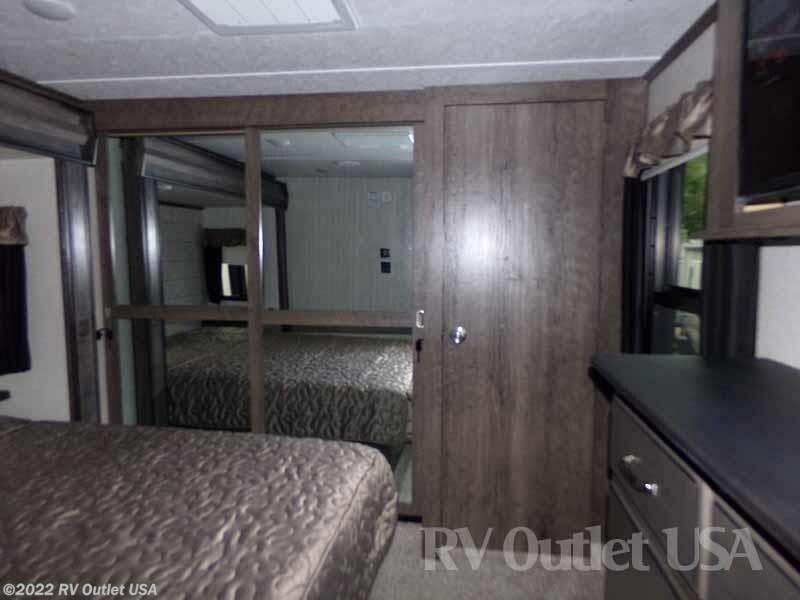 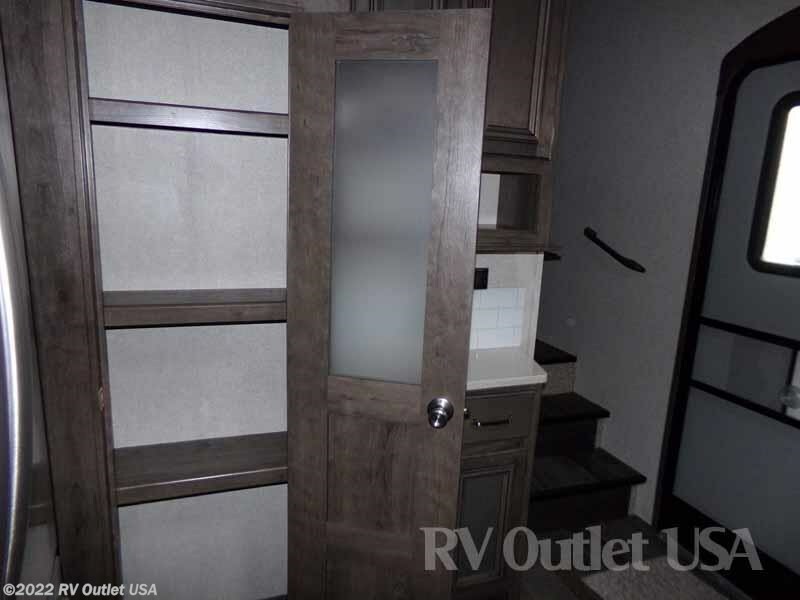 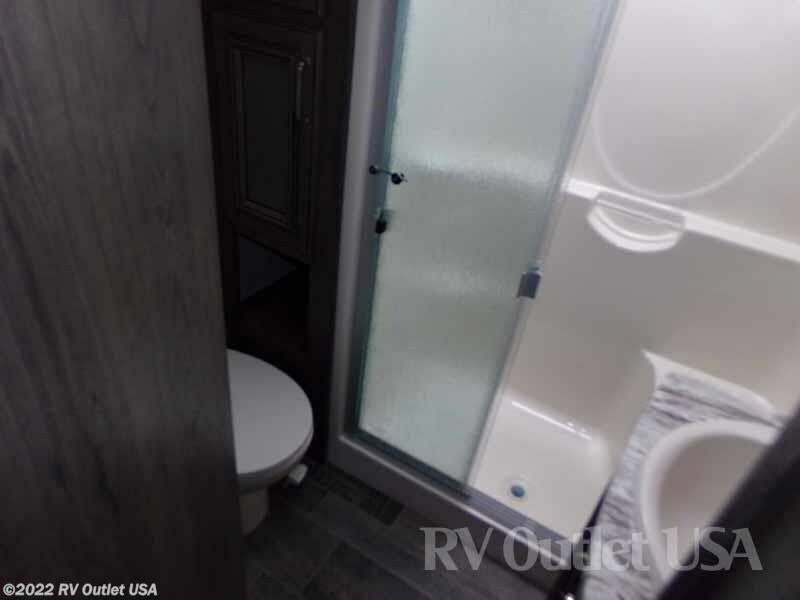 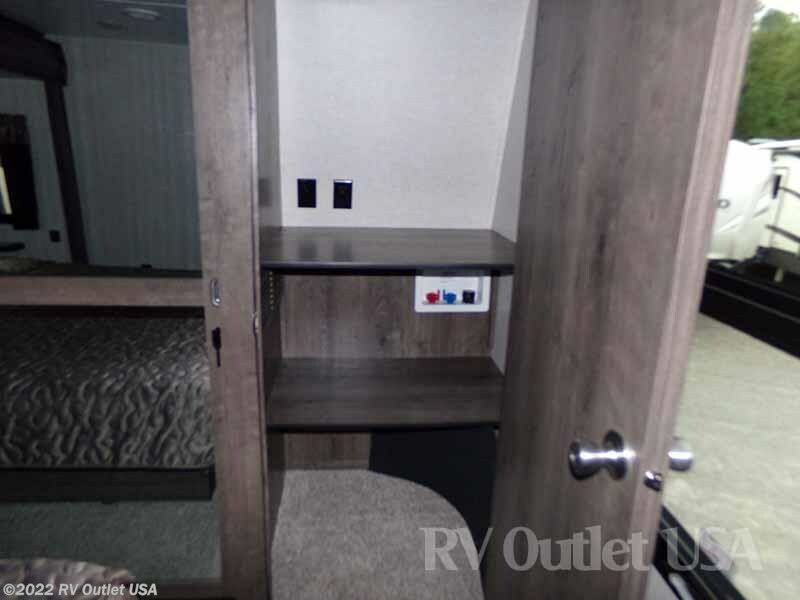 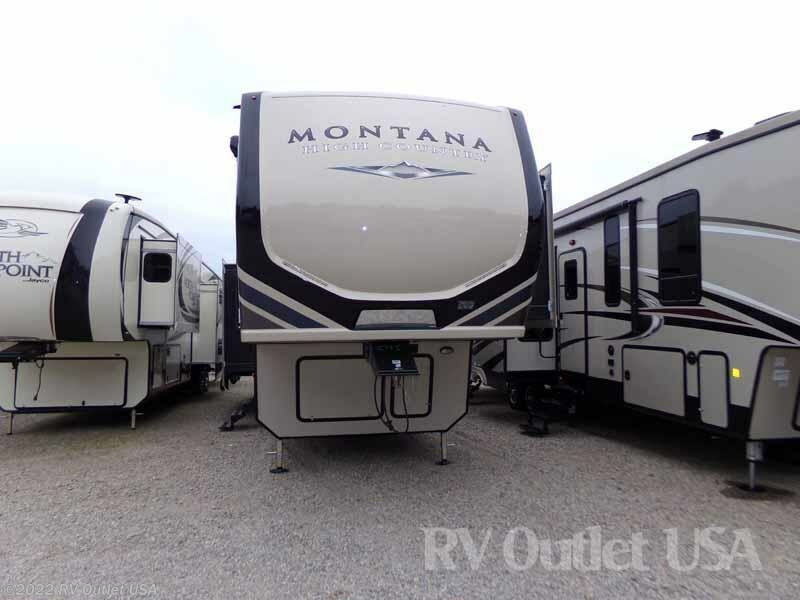 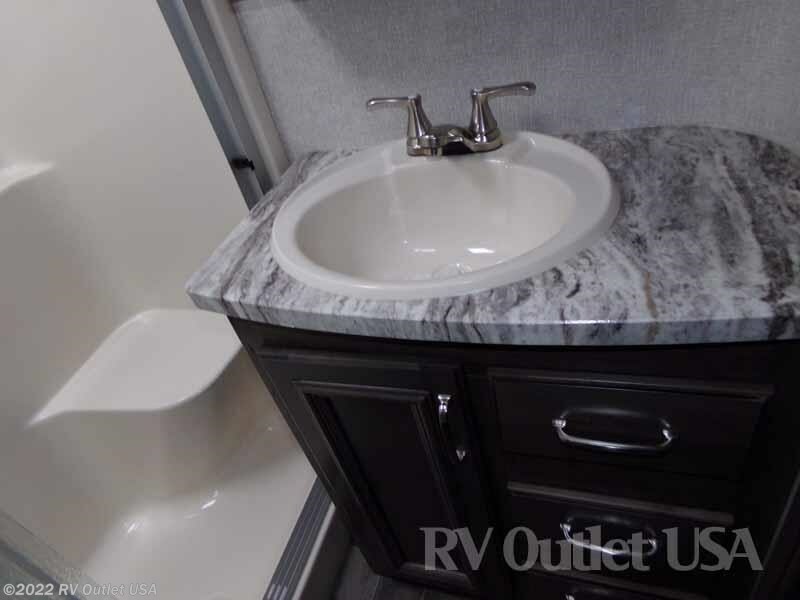 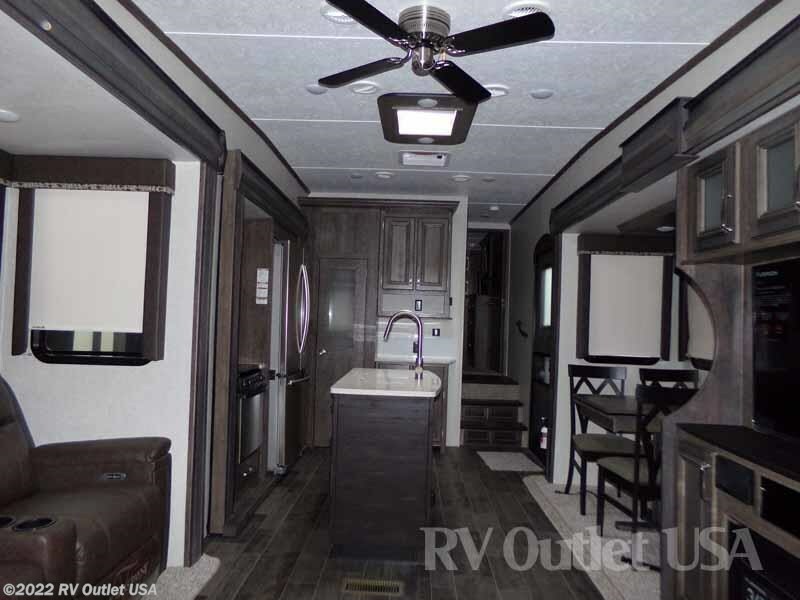 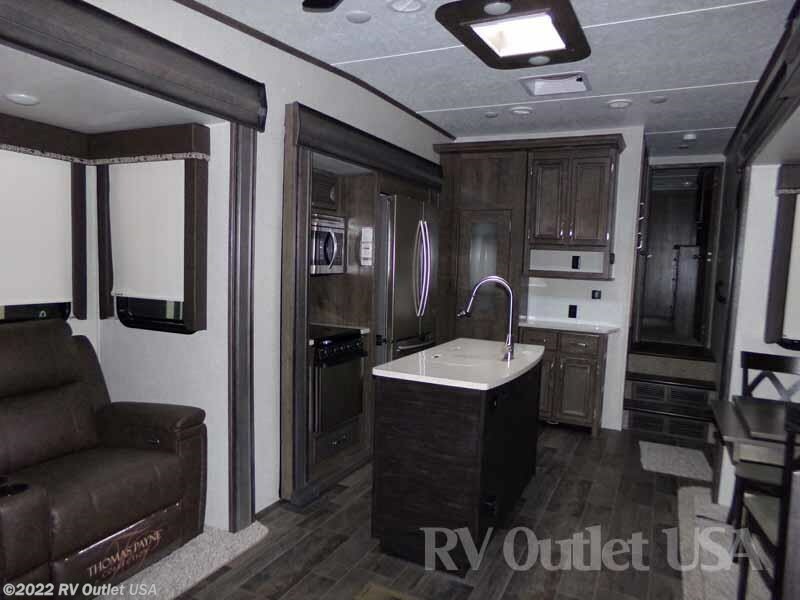 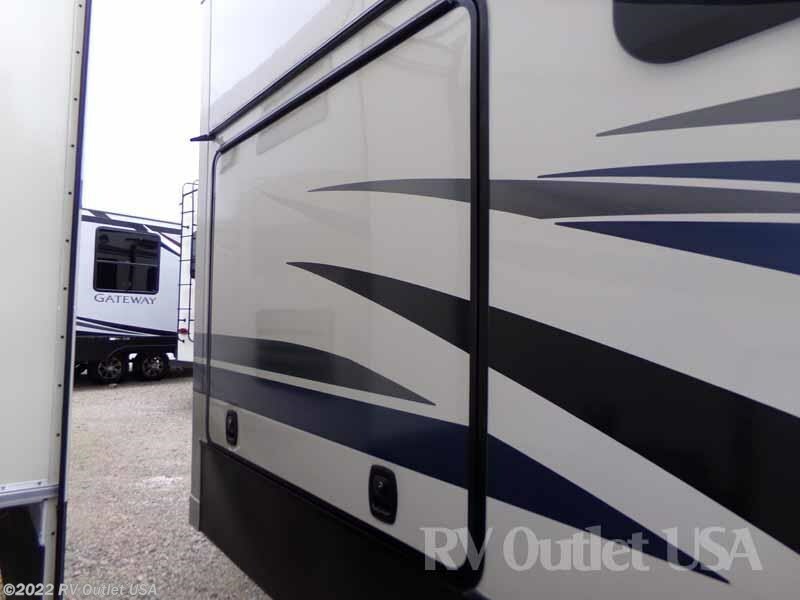 This 5th wheel also has a super nice side aisle bathroom with a porcelain foot flush toilet, a sink with underneath storage, a lighted medicine cabinet, and the huge Mega shower which is big enough for (2) people to stand in at one time! 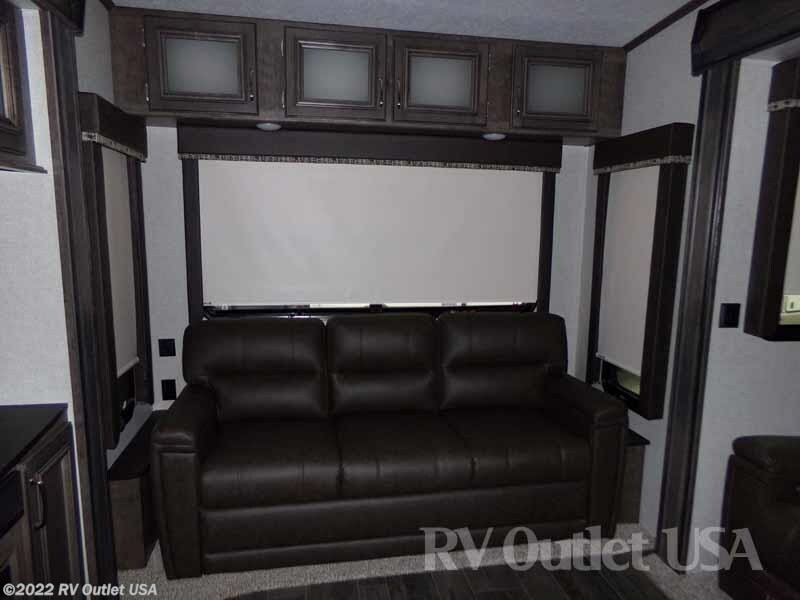 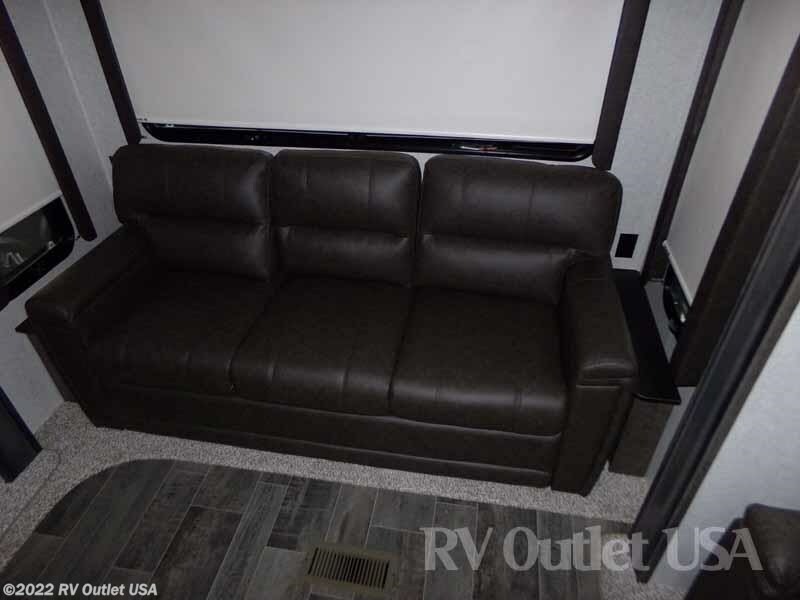 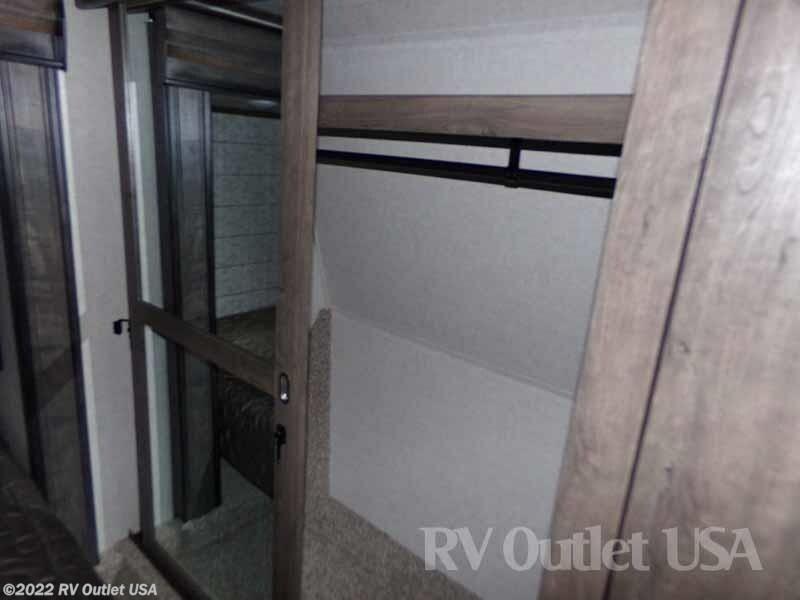 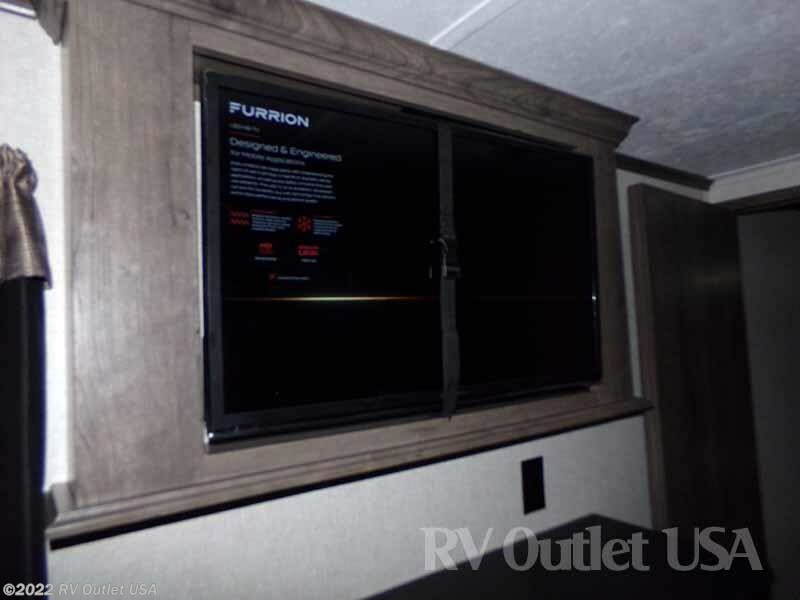 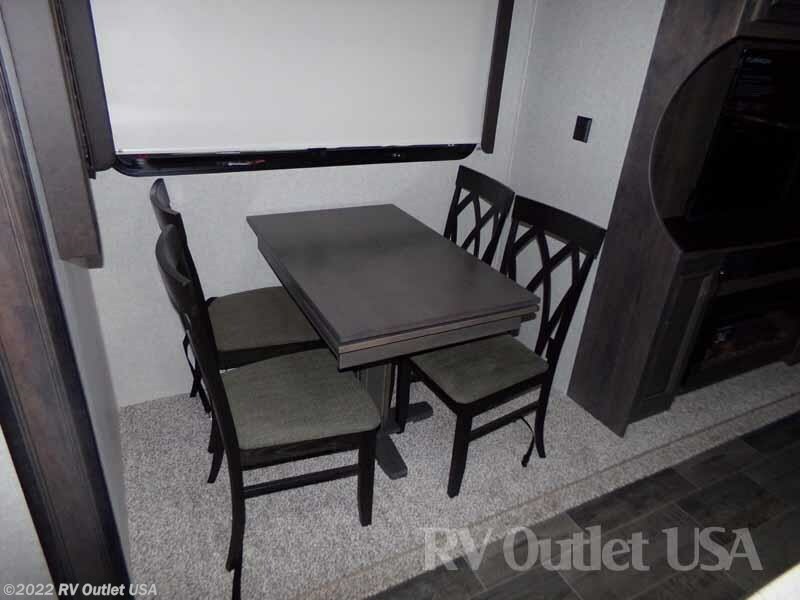 The living area in this RV is very spacious because of the (3) slide outs. 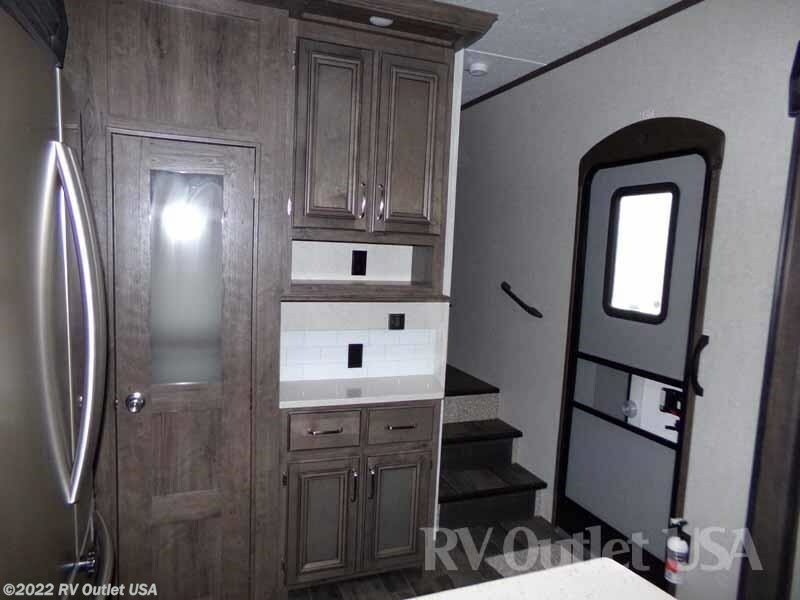 The slide on the off door side towards the front has a full galley (kitchen) slide with a (3) burner cook top, an oven, a 30" residential style microwave oven, a large pantry for food storage and the new 22 cu ft residential French door refer with built in ice maker and all the appliances are stainless steel! 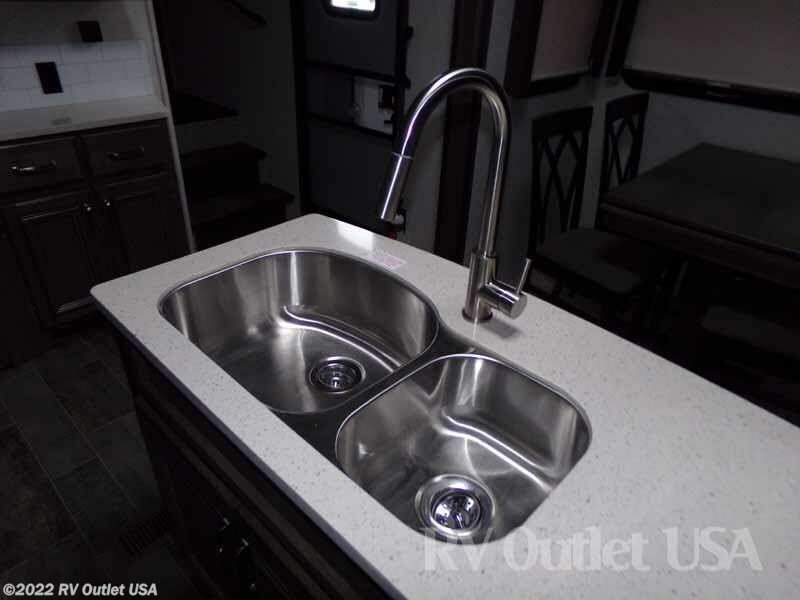 This 345RL also has a kitchen Island with a double stainless steel sink and lots of storage underneath. 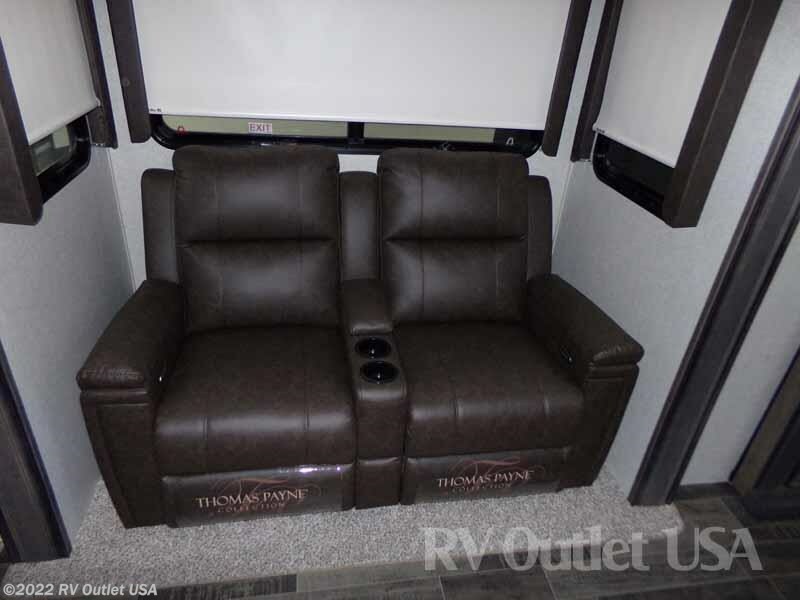 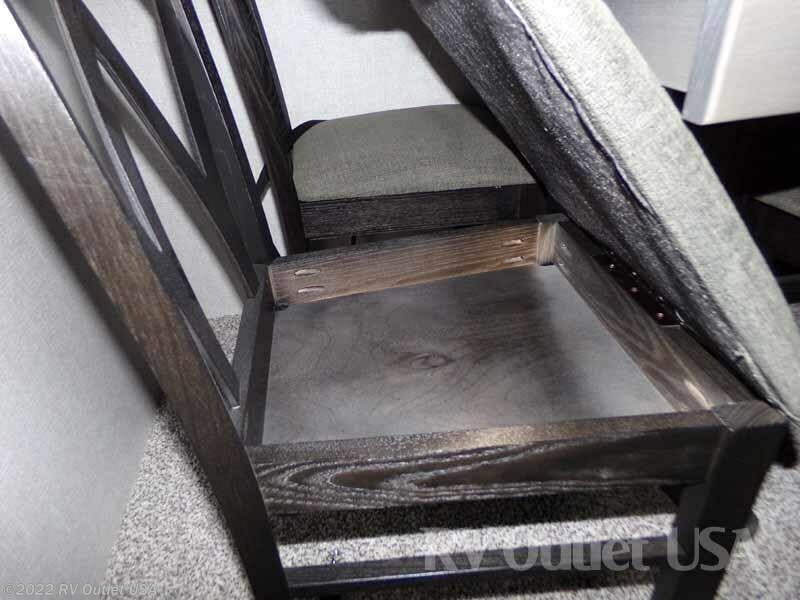 In the rear on the off door slide is another slide with the Theater seats which face the TV perfectly! 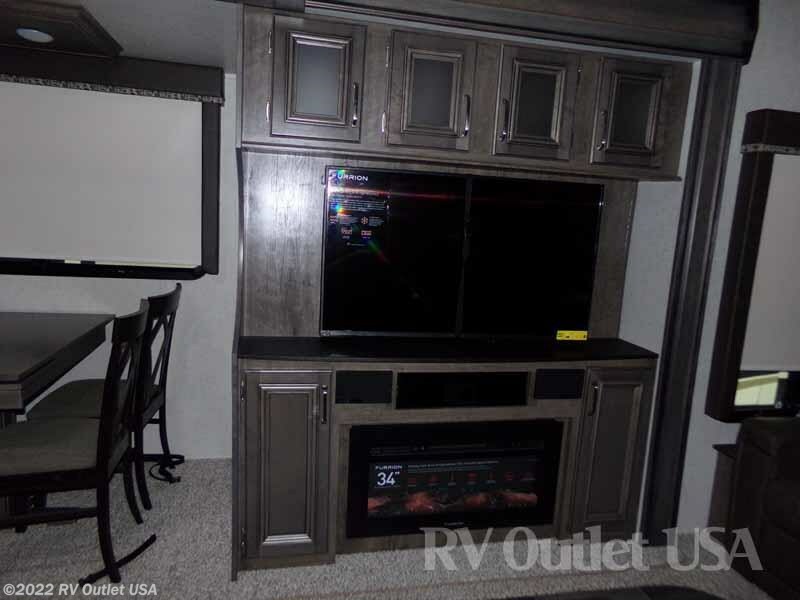 The slide on the door side is a super slide and has the free standing dinette with (4) high back chairs and the entertainment center with a large LED TV and below that, the electric fireplace. 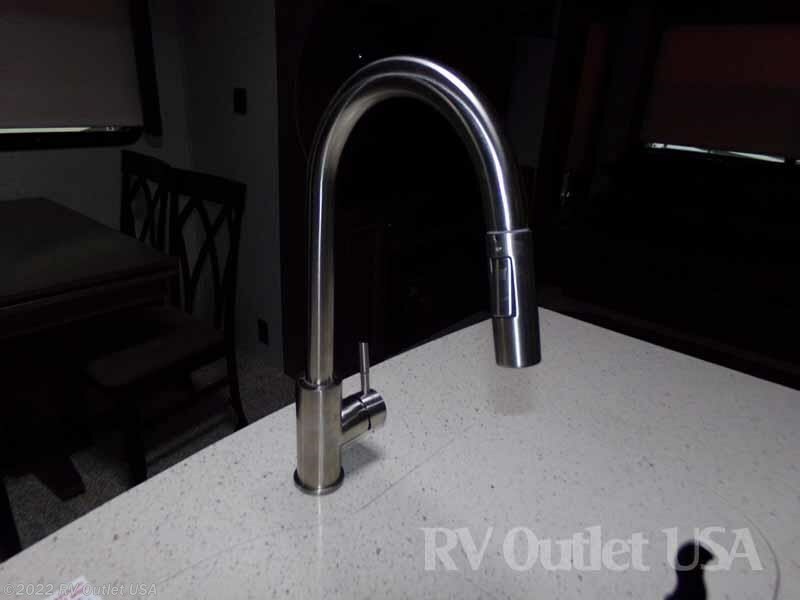 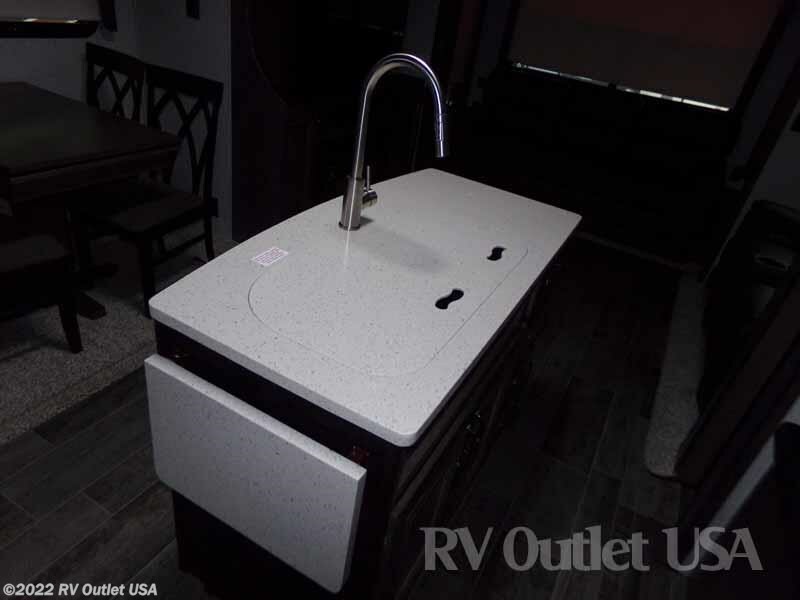 On the outside of the RV behind the entertainment center is the exterior kitchen! 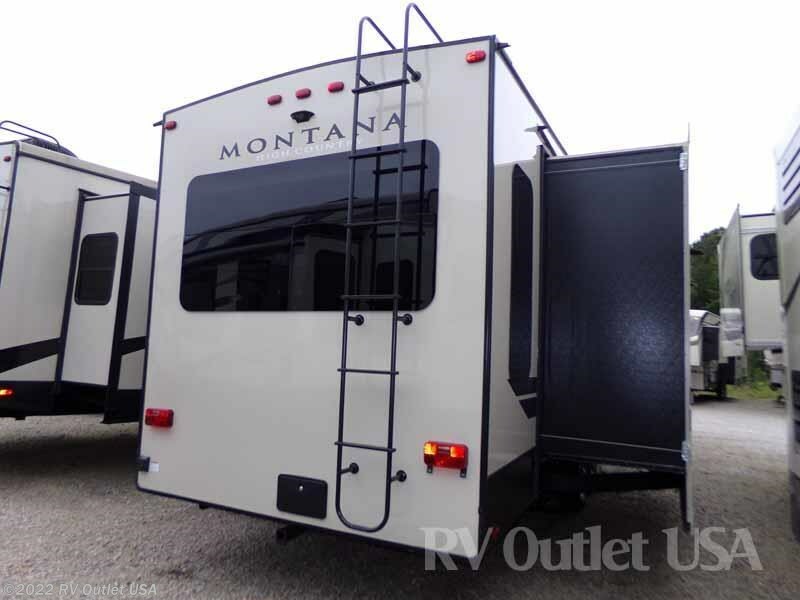 Again, it's a really nice 5th wheel with a TON of nice features and options. 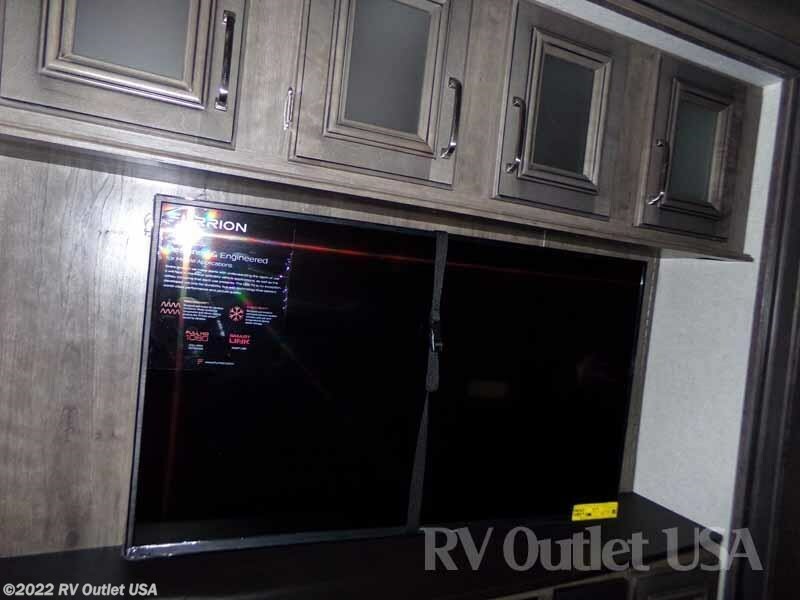 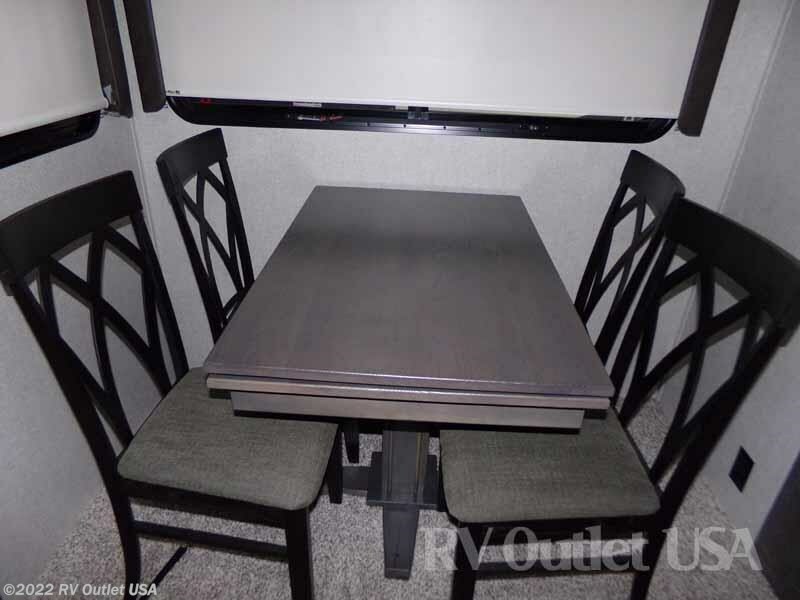 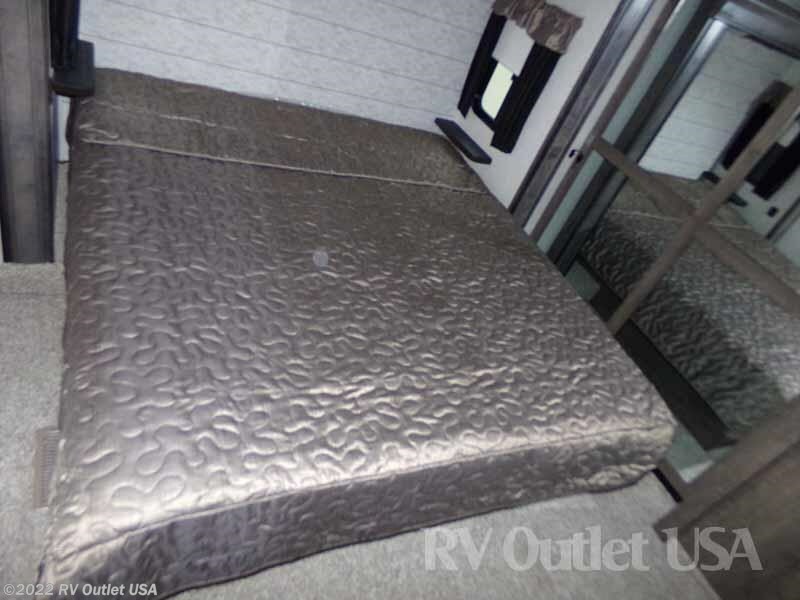 Here's a list of options that were ordered on this RV. 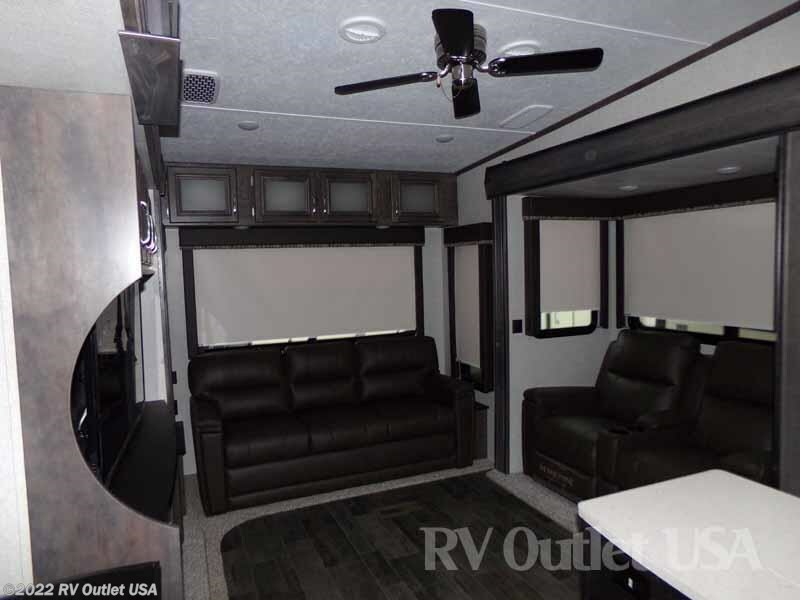 The interior color is the new Estate. 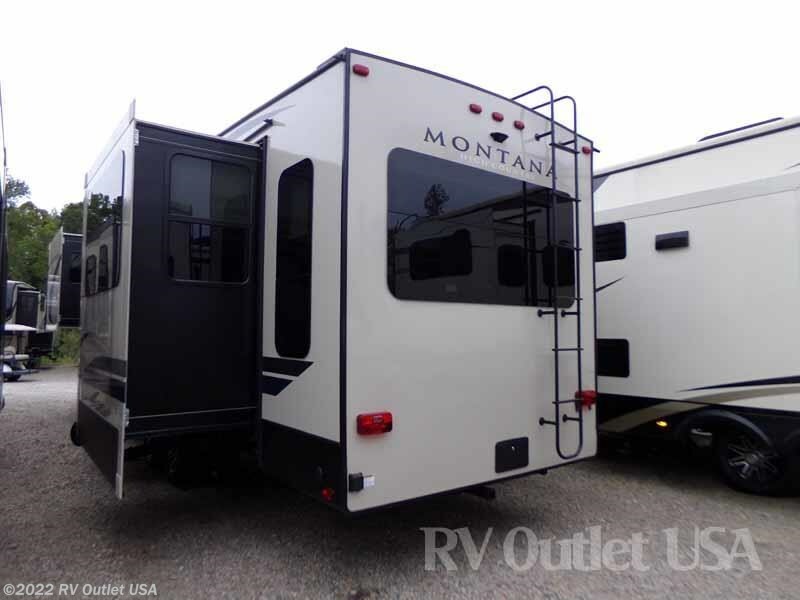 It has the High Country Residential Living package and the High Country Four Seasons package! 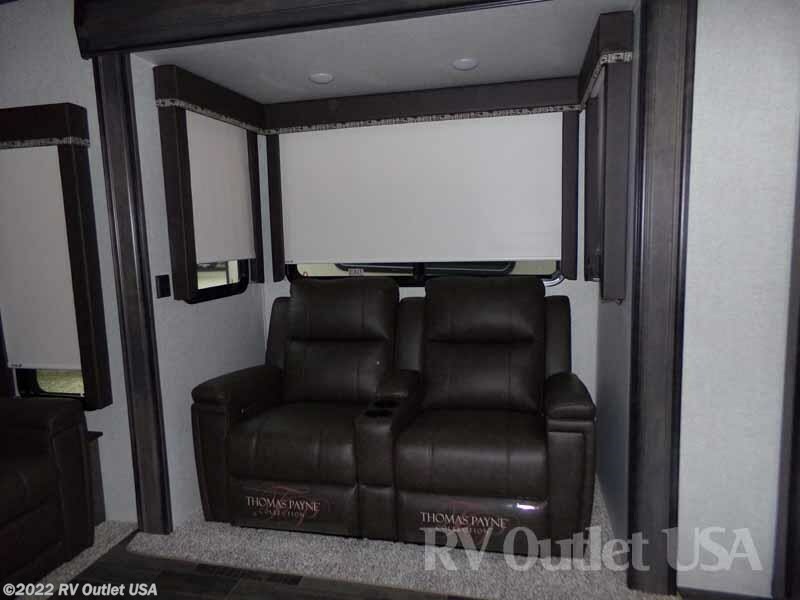 Additional options are, the dual A/C package with a 15K BTU in the main living area and a 13.5 low pro in the master bedroom, frameless tinted windows, and the Mor-Ryde suspension, the ever popular auto leveling system, the upgraded theater seats, an electric fireplace, a power awning with LED lights, the new 22 cu ft residential style French door refer with ice maker, a King size master bed, a 2" receiver hitch, and the free standing dinette with (4) chairs!